Throughout the 20th century women have achieved civil rights and have massively joined formal education and employment; nevertheless, there is yet a long way left to achieve effective equality. Inequality between maternity and paternity leave is one of the elements both reflecting and reinforcing obsolete patterns of a society, despite the fact that nowadays the majority of citizens back the idea of co-responsibility and the eradication of the sexual division of labor. 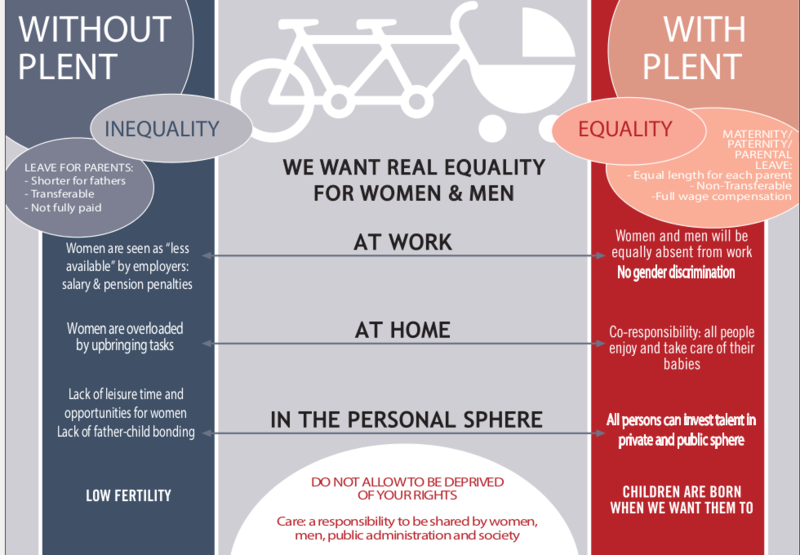 The Platform for Equal and Non-Transferable Parental Leave promotes an open debate to address the consequences of existing inequality, and, furthermore, the opportunity and convenience to incorporate gender equality goals into the political agenda. Accordingly, PPIINA is organizing the 3rd EUROPEAN CONFERENCE, where all organizations and individuals interested in supporting progress towards gender equality can converge: from feminists to groups of egalitarian men, as well as youth groups, trade unions, civil society organizations, members of the Spanish Parliament, public administration and the academic community. The debate goes beyond labor and social security rights to encompass the larger question regarding what kind of society we want to live in. This question acquires special relevance in the present political and economic context. Indeed, the economic crisis and the changes in the labor market make even clearer that the shift of public policies towards full gender equality is the only way to effectively achieve equality in the labor market, to protect children rights and to help families in need. Moreover, the current demographic crisis and the need for a sustainable development make these changes even more urgent. Equal, non-transferable and fully paid parental leave is the hallmark of this orientation. 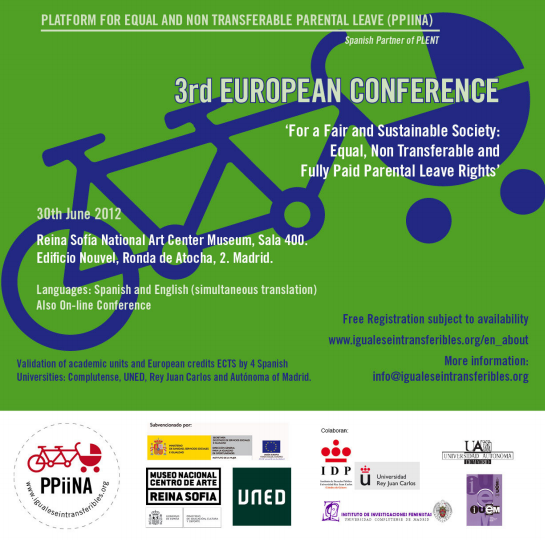 The 3rd EUROPEAN CONFERENCE ‘For a Fair and Sustainable Society: Equal, Non Transferable and Fully Paid Parental Leave Rights’ will take place on June 30th 2012 in Madrid. The call and organization of this 3rd European Conference are being supported by the organizations composing the PPIINA and the PLENT, as well as the following Spanish institutions: Ministry of Equality (through the Women’s Institute), five universities (Complutense, UNED, Rey Juan Carlos, Carlos III and Autónoma). These universities will validate academic credits for students. 1. International experiences regarding the use of parental leave by men and women in connection to the diverse leave policies. 2. Parental leave inequality and the new division of labor: implications for employment, productivity and demography. 3. Effects of Leave Inequality on the conformation of gender roles. 4. Co-responsibility, equality and non-transferability of labor and social rights. 5. The politics of parental leave policies: current situation and institutional proposals. 6. Networks to generate social change: exchange and coordination among different European groups. 7. Experience and evidence from different parental leave regimes. Conference Venue: Reina Sofía National Art Center Museum, Madrid. Edificio Nouvel, Ronda de Atocha, 2. Madrid. Sala 400. Validation of academic units and European credits ECTS by five universities: Complutense, UNED, Rey Juan Carlos, Carlos III and Autónoma of Madrid. 12:00 Equal, Non Transferable and Fully Paid Parental Leave: a Real Utopia? Hildur Jonsdottir. Adviser on Gender equality issues to the Icelandic Prime Minister. María Pazos Morán. Institute for Fiscal Studies and PPIINA. Hildur Jonsdottir will present the experiment she directed in the Reikjavik Municipality. 17:45 We Act for Equal, Non Transferable and Fully Paid Parental Leave! Representation of PPIINA: Natalia Serrano Serrano, Cristina Bajo Enríquez, Susana García Bunger, Marian Alonso Casado, Aida Reinoso Acero, Elena Peñafiel Sanz. Tagged Gender Equality, PLENT News. Bookmark the permalink.